View of the old East Gate of the medieval walled town of Exeter. It was a huge and impressive structure. In the print, can be seen the a statue of Henry VIII in a toga over the archway. By the late 18th century the population of Exeter had greatly increased, but were living in the cramped conditions caused by the town wall. 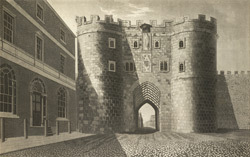 In 1769 the North Gate and in 1784 the East Gate were demolished to ease the flow of traffic. Later prints show the space created allowed a much broader High Street.